I wanted to write a letter to all of the families in our youth group and those with students coming up and fill you in on our plans through the summer. This year we are inviting the new 6th grade students to join us as early as May 21st which is our End of the Year Party which is simply a time to eat lots of food and play lots of games. This will be from 6-8 pm as will the next week when we welcome anyone who can help us go throughout our neighborhoods dropping off fliers for this summer’s day camp. For the new 6th grade parents, if you haven’t already seen from the gas station we use on Sundays to sell gas cards for Holiday and KWIK TRIP, we have made almost $6000 in profit over the last two years selling prepaid gas cards. Your students and quite often a parent are welcome to sign up to work the gas station every Sunday and as well, feel free to buy gas from it and earn 5-10% profit off of it as well. As we enter into the fall, we will again offer a lot of other fundraisers as we plan for two big trips next year (the Mexico Mission Trip and the Youth Convention in Colorado). Feel free to also use the fundraisers for summer camps and any of the retreats we participate during the year as well. 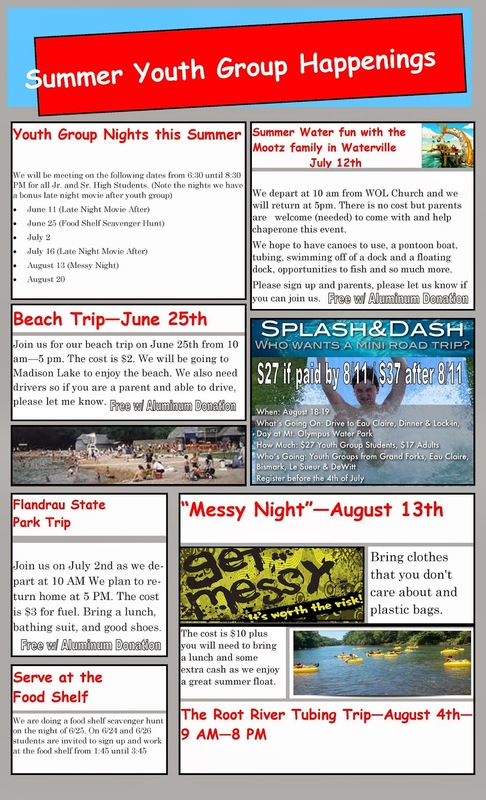 Over the next few weeks we transition into summer mode for our youth group and our summer schedule is much more casual, relational and event oriented. We would love to have your students join us then. Our hope is that our students will connect with us, grow with us, invite their friends to check us out while we have a good time together and as we look into God’s Word in a safe place. For all off campus events, all students must have a new 2014/2015 release form completed. I have included that here as well.